With the long weekend in May giving staff and students a Monday off, Bob and I decided to rent a car and go on a road trip. We looked at a map with Neuchâtel in the centre and then figured out where to go. Should we travel to France? 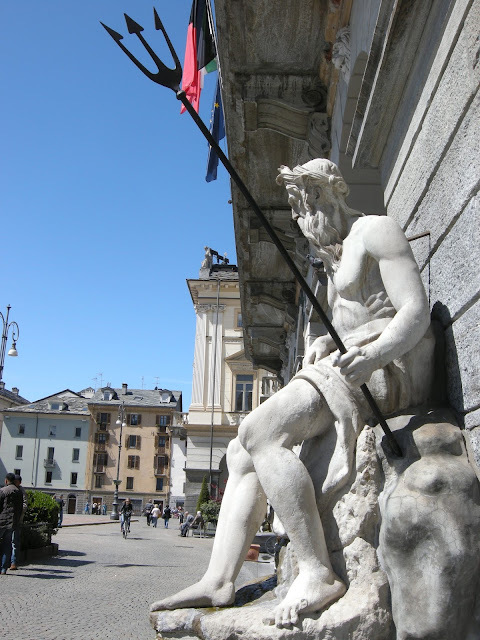 to Austria? to Germany? 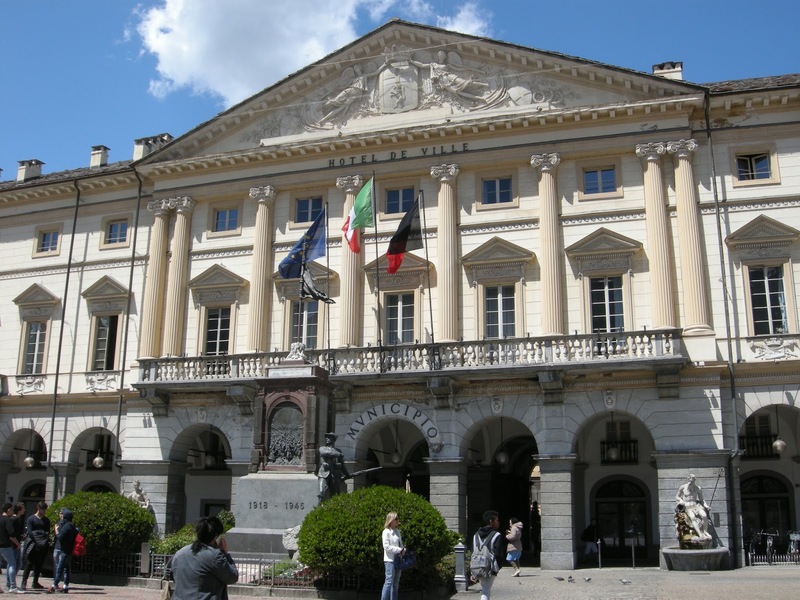 to Italy? All are close enough that we can get there in a few hours. Bob suggested Torino (Turin) in Italy, a city that I had not even considered. On further examination, I discovered that it has much to commend about it, as you will soon see. This choice of destination would mean that we would spend our weekend close to the Alps–in three countries. 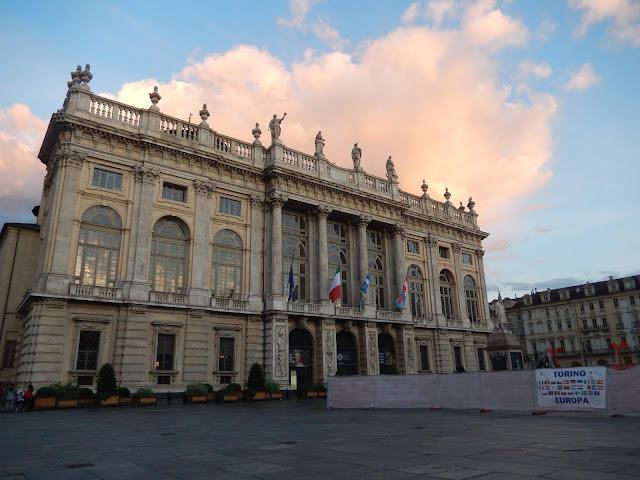 Since we were not free to leave until after the last class on Friday, we drove south to Grenoble, France that evening. That was a good idea. As in Toronto, traffic increases here on a long weekend, and crossing the border from Switzerland to France can take some time. Hence our two and three quarter hour drive took nearly four hours. Place St-André in the rain. 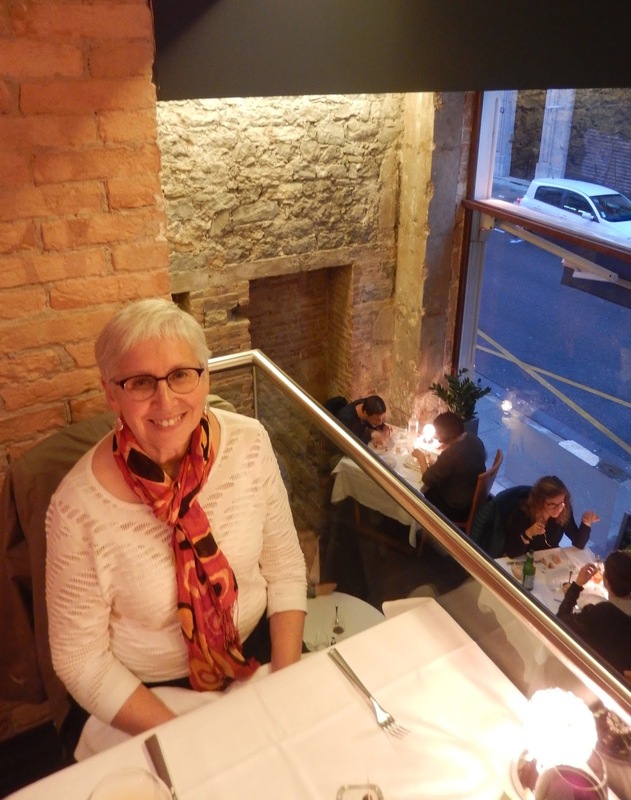 We dined at La Girole, just as I had with Jen, Dan and Paul when we visited Grenoble in 2015. I had visited Grenoble with colleagues in January, 2015, but I wanted Bob to see the place. 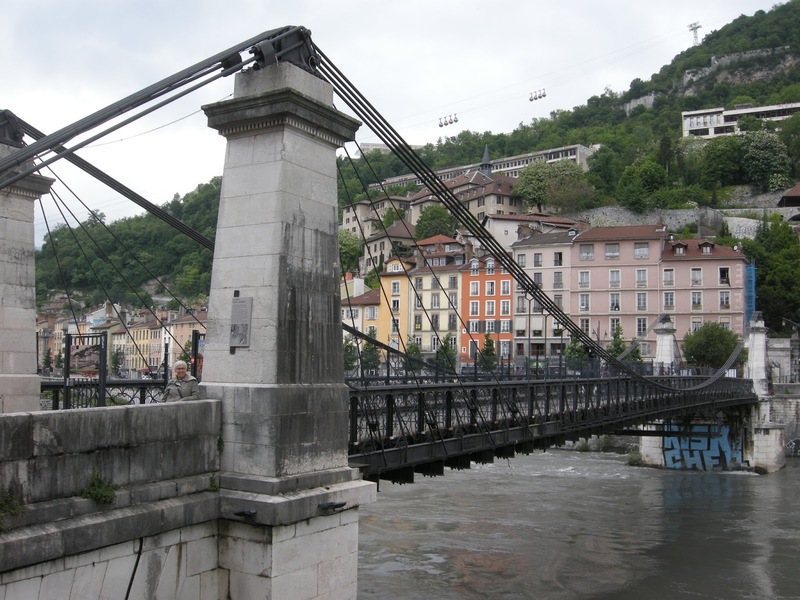 The host city of the 1968 Winter Olympics, Grenoble is nestled among several mountains. 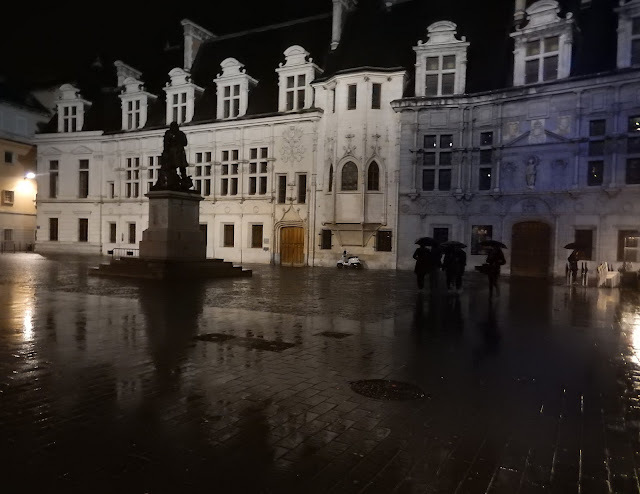 Unfortunately, we had rain and dull skies during most of our time there, so we did not see the city in its full glory. Saint Louis Church near our hotel. 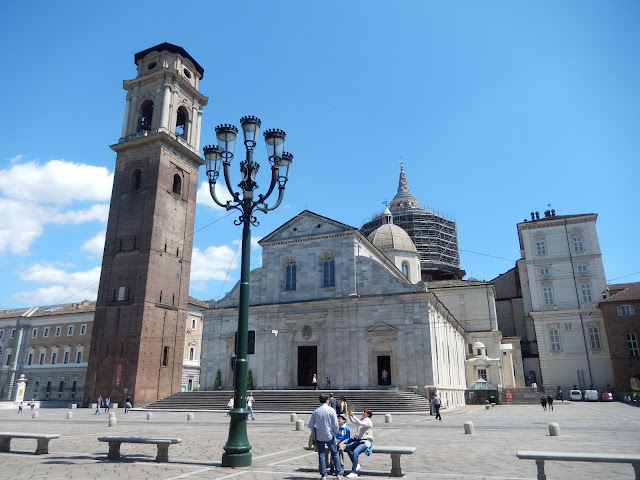 Nevertheless, we explored the town quite thoroughly, both on Friday evening and on Saturday morning when we followed the walking tour suggested by the tourist office. That way we passed by the important sites of the town, and thankfully, managed to stay dry. 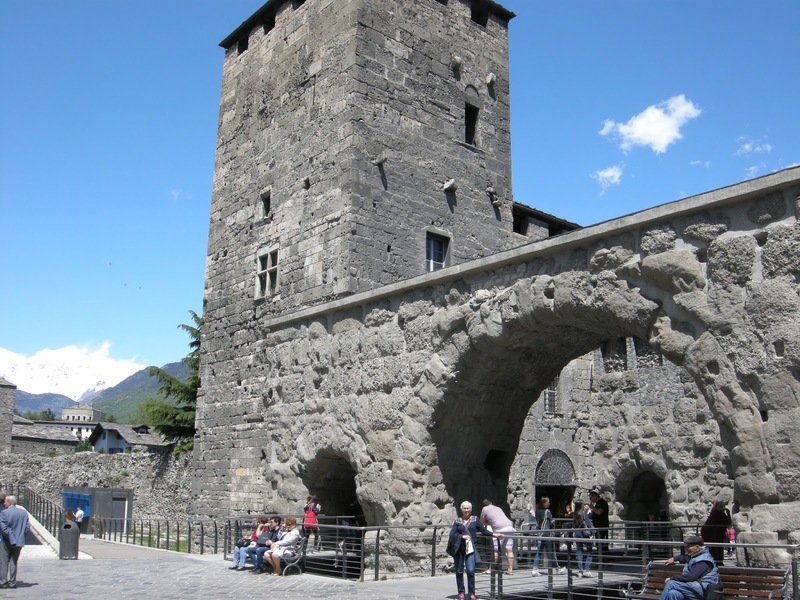 The tower of the "Cash"
Grenoble was the home of Stendhal, and the site of an uprising that was a precursor to the French Revolution. 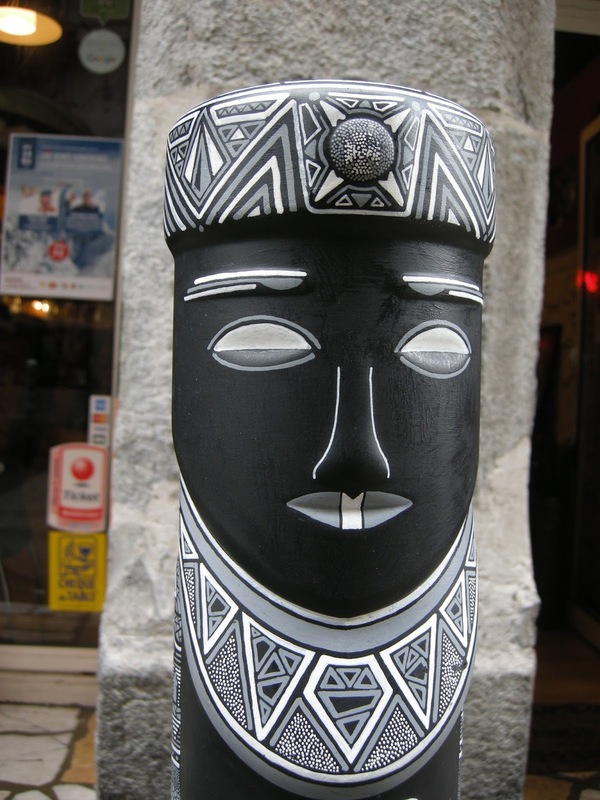 We were charmed by the ethnic quarter where bollards (posts by the curb) were painted with faces. 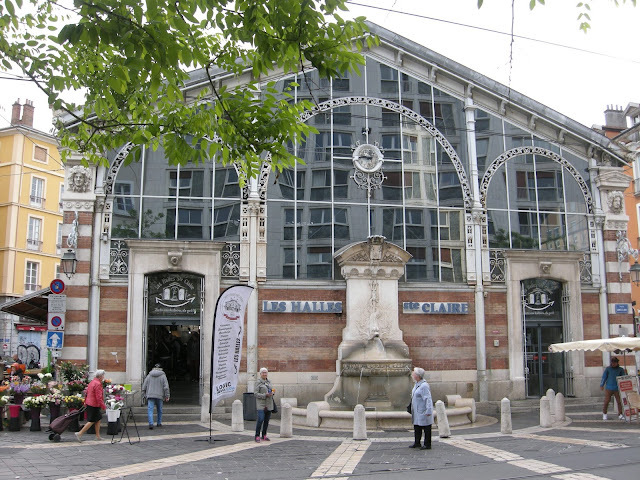 Of course, we also enjoyed the Saturday marchés, where locals gathered to get the freshest produce, cheeses and meats. I stand outside the market building. Just after lunch, we hit the road in order to make our way to Italy. 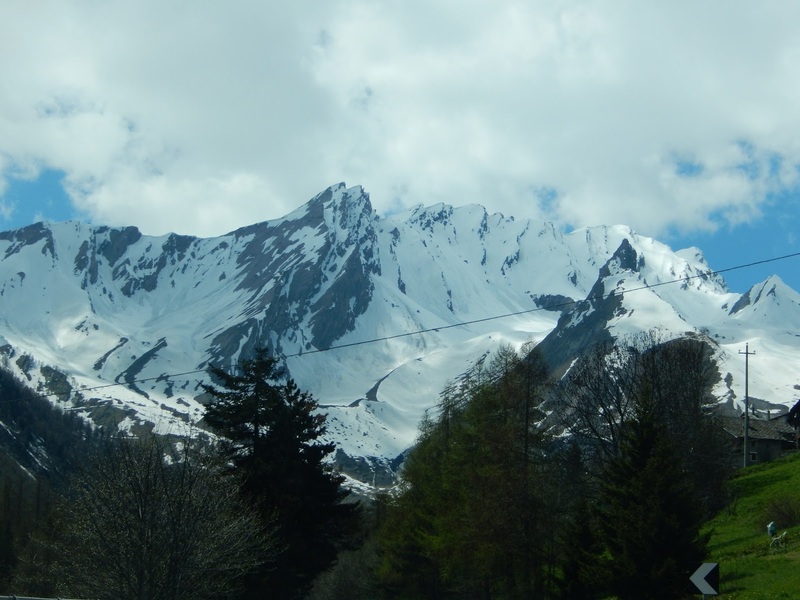 The drive was spectacular as we were in the mountains most of the time. 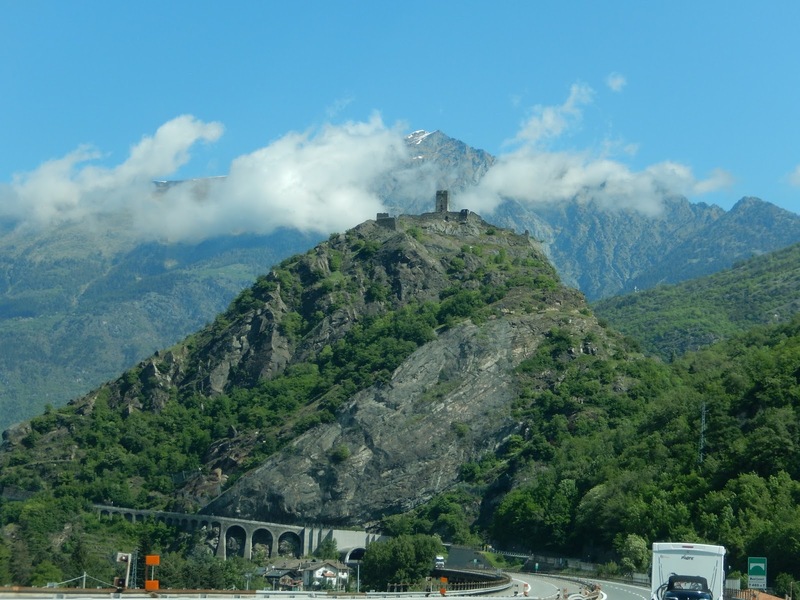 Sometimes, we went through the Alps rather than around them. 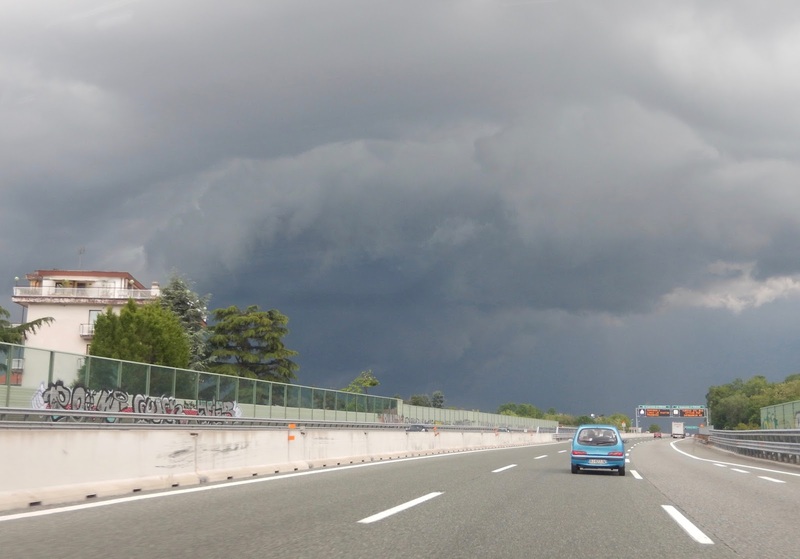 The Fréjus Road Tunnel was particularly impressive–and expensive, too. At 8.1 kilometres, it is very long. It has its own radio station to stay in contact with drivers passing through it. As we neared Turino, we were greeted by dramatic skies. Storms hit the area just as we did. And did it ever rain! During this time, we got lost and it took us a while to find our hotel. 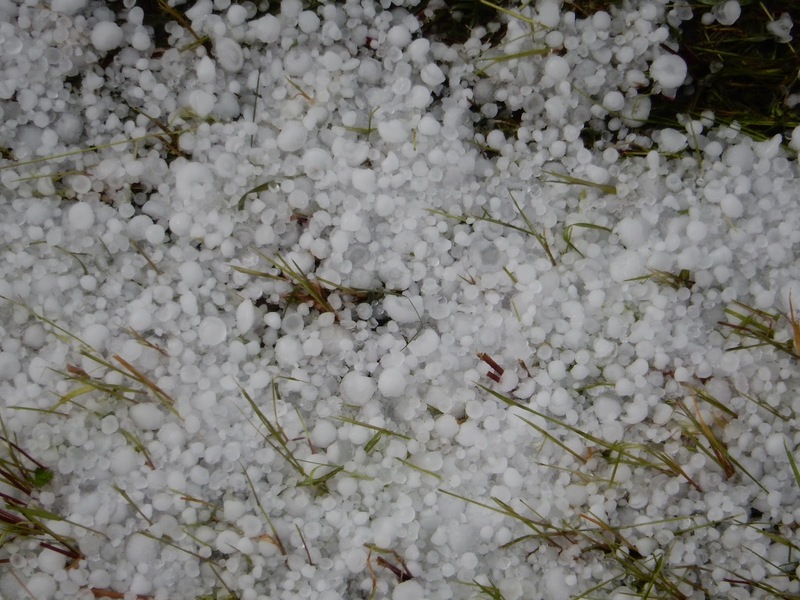 This may have been a blessing in disguise, since we missed the centre of an intense thunderstorm. When we arrived at the hotel a half hour later, we saw what looked like snow on the ground, but it was hail, with large hailstones. Tree branches were strewn on the hotel road and lots of leaves had fallen to the ground–and it was pouring still. There was also a power outage at the hotel shortly after we checked in. This dramatic interlude soon passed and we headed downtown on the tram for dinner, and some evening explorations of the city. 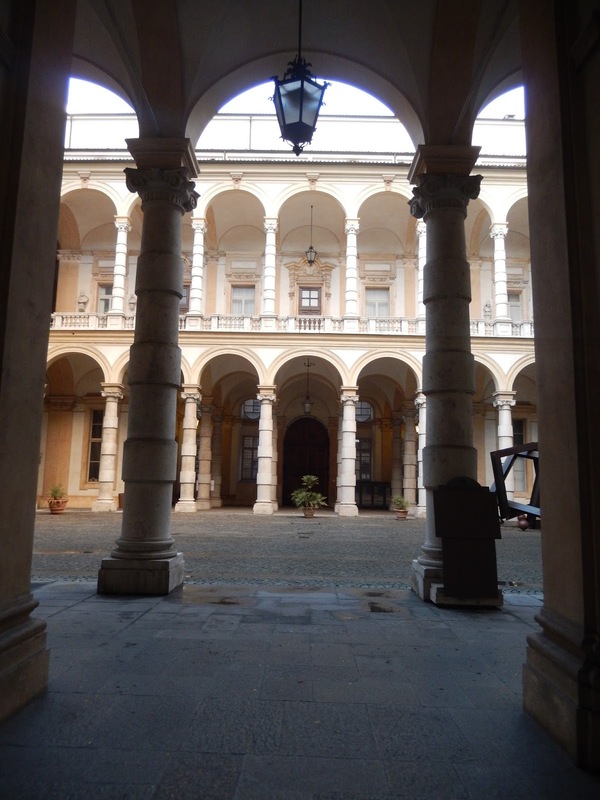 We walked the length of the Via Po, where we saw a couple of churches and several university buildings. 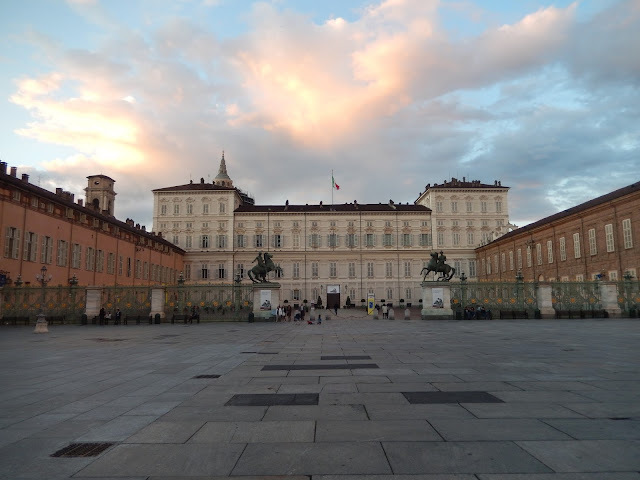 Torino is larger and more magnificent than I expected. On that first evening, we only caught a small glimpse of its beauty, especially towards sunset. It would reveal itself in its full glory the next day. Sunday morning was bathed in sunshine, a welcome change from the weather of the first two days of our long weekend. Bob (who had done all the research for this trip) suggested we take the tram to the Basilica of Superga, a church perched high above the city. Near our hotel, a cog railway, the Sassi-Superga, travels up the mountain every hour, so off we went to get on the first train. 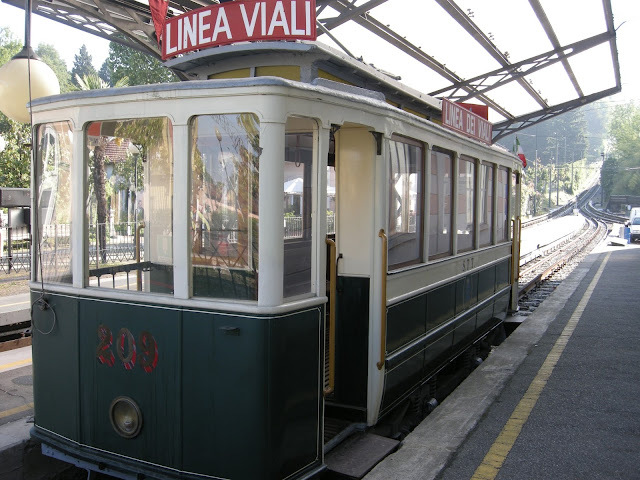 The Cog Railway car: not working on this day. We soon discovered that the railway was closed for the day as a result of the storm the day before, but fortunately, there was a bus to take us to our destination. This was a spectacular spot. 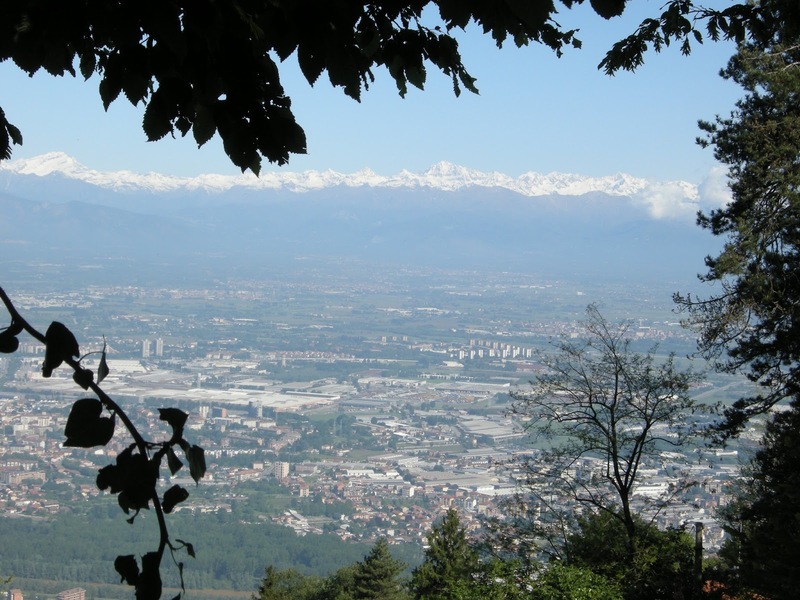 From a terrace in front of the basilica, we could see the city below us and a vista of snow covered peaks in the distance. Wow!! The church itself was much smaller on the inside than it appeared from the outside, a fact which allowed us to visit it quickly before Sunday Mass began. 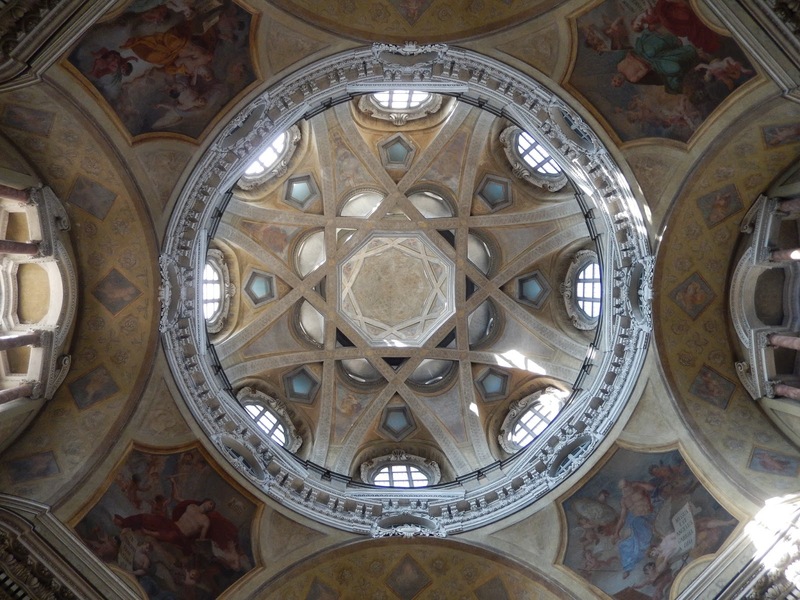 Like many Italian churches, there was a spectacular dome in the centre of the building. 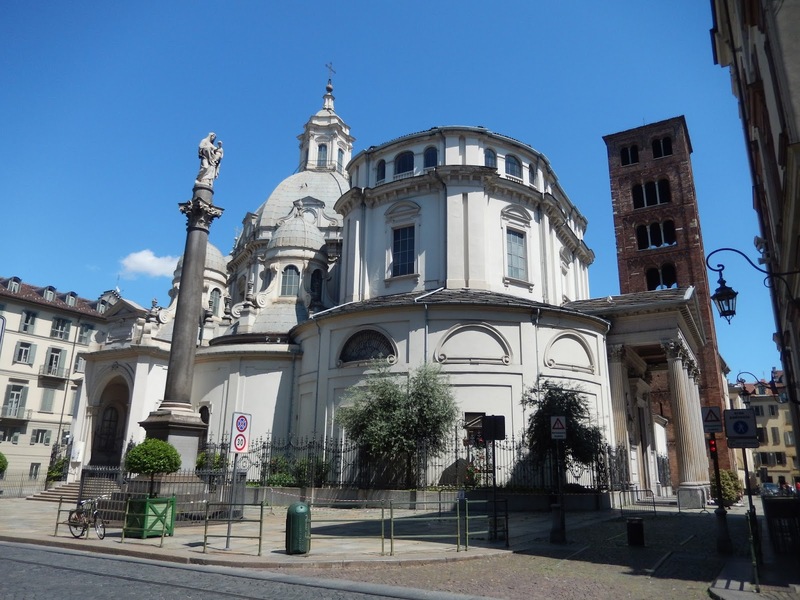 We would see many such domes in the city later that day. 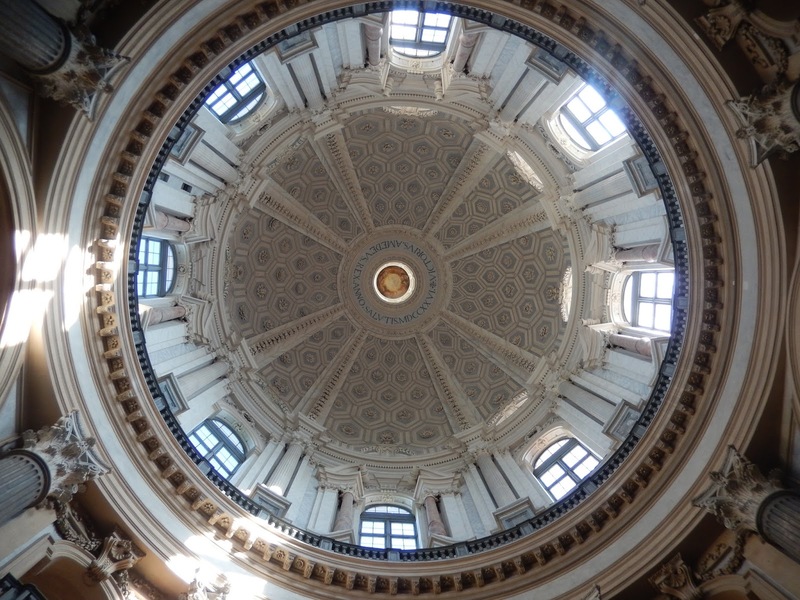 The dome of the San Lorenzo Church (which we visited later that day). There is a pathway that encircles the basilica. 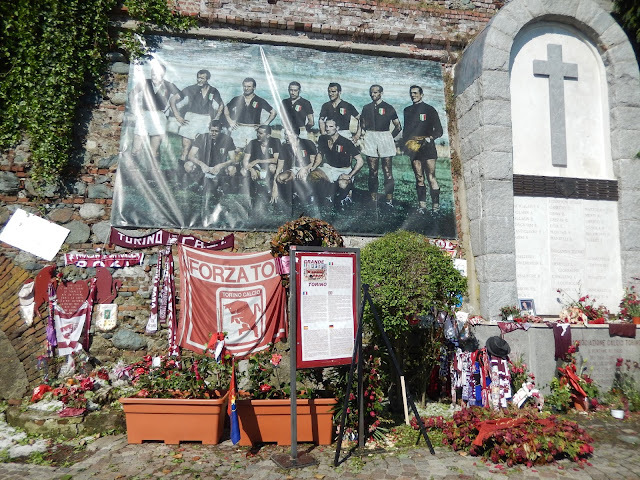 We followed it around to a memorial in remembrance of the Grande Torino soccer team, all of whom were killed in 1949 when their plane crashed into the side of the mountain. These men were almost all on the Italian national team, so this was a great loss to the country. After an hour above the city, we made our way down into it by bus. There was a great deal to see so we spent much of the rest of the day exploring. 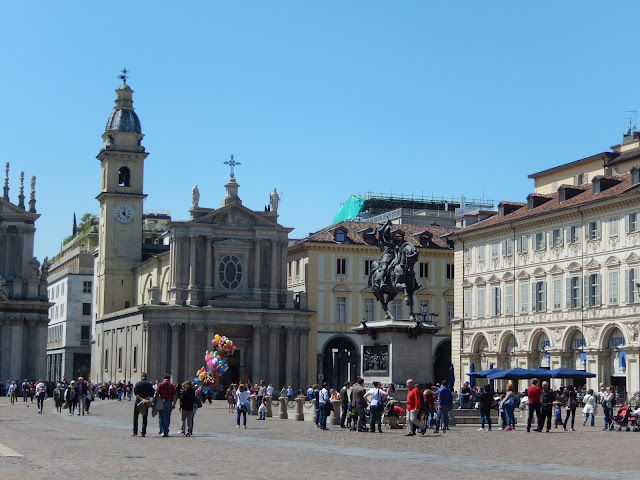 I have much to say about beautiful Torino. It is, for one thing, a great city for shopping. 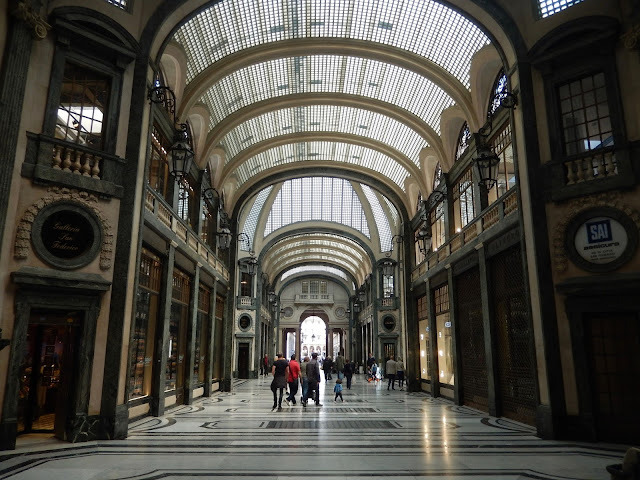 It is full of arcades; some are fully enclosed, while others are open to the street on one side. 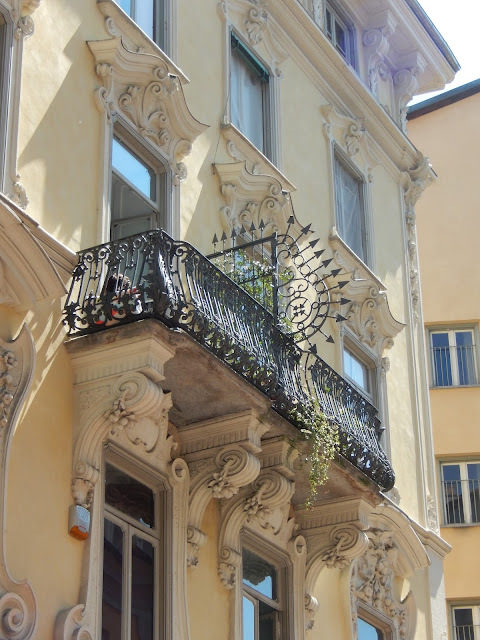 We later learned that a member of the Royal family wanted these built because he hated being caught in the rain, so even today, people can enjoy the city's shops even in bad weather. 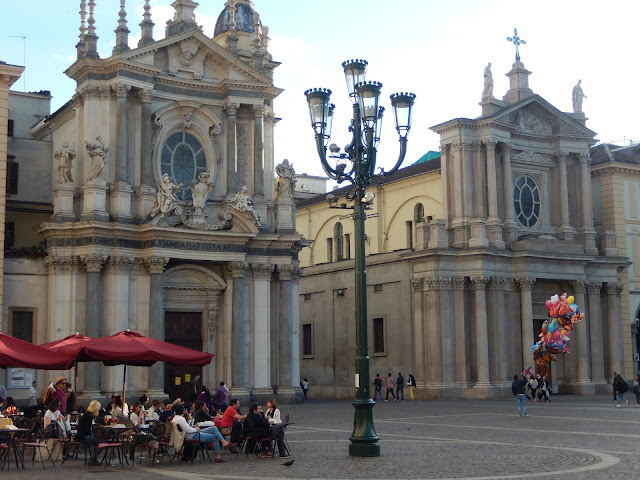 These twin churches reminded us of the Piazza del Populo in Rome. Torino's grandeur comes from its former position as capital of the House of Savoy in the 16th century. 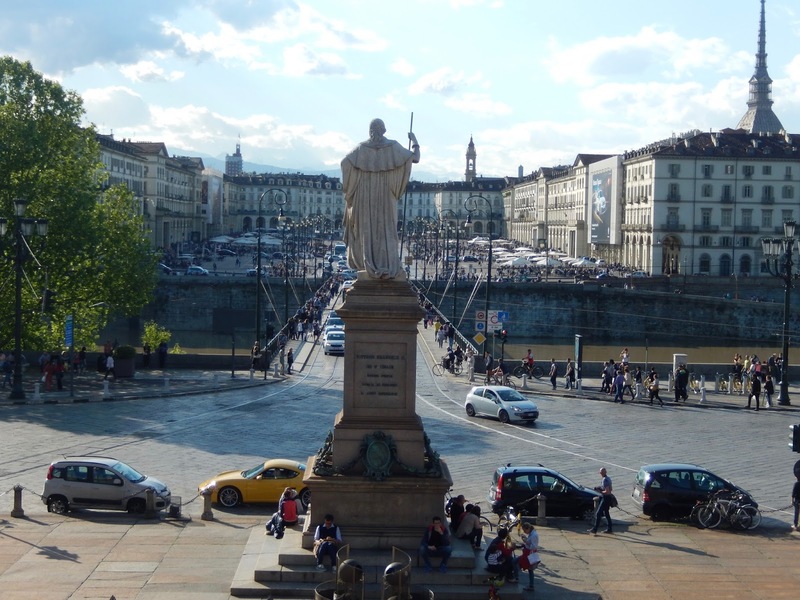 Later, from 1861 to 1865, it was the capital of a newly unified Italy. 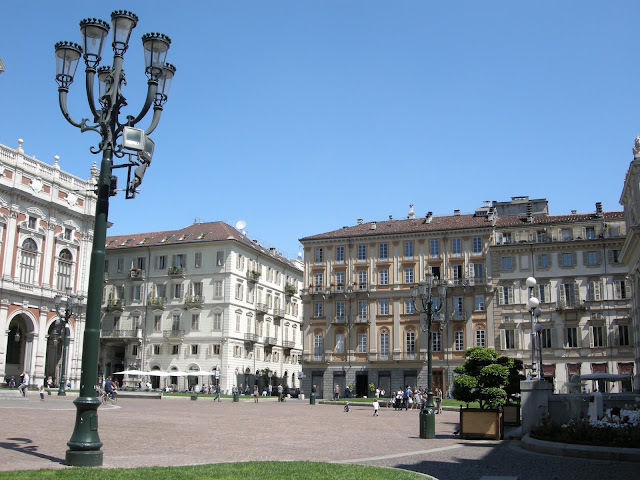 With such a high profile, city planners built some beautiful piazzas. 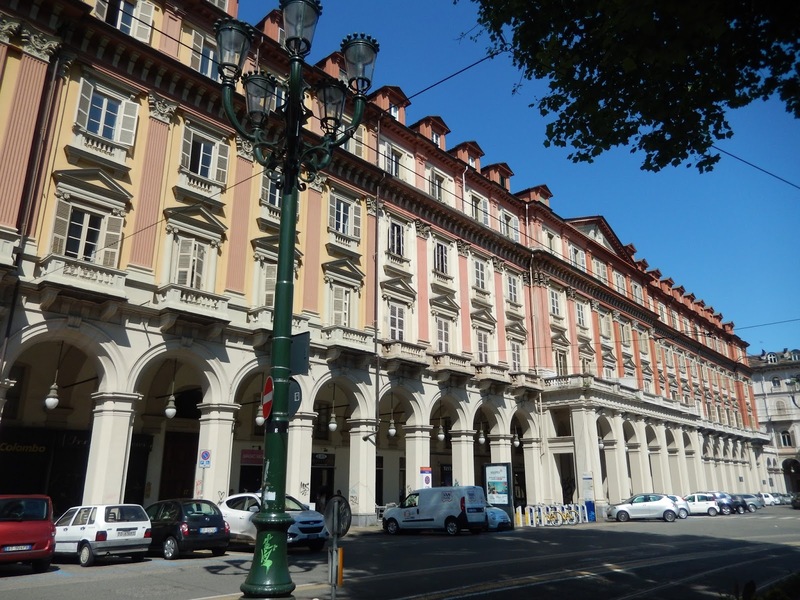 We were particularly impressed by the majestic buildings in the Piazza Carlo Alberto and also, the very large Piazza San Carlo, with its two churches side by side and equestrian statue in the centre. The shroud of Turin is here. 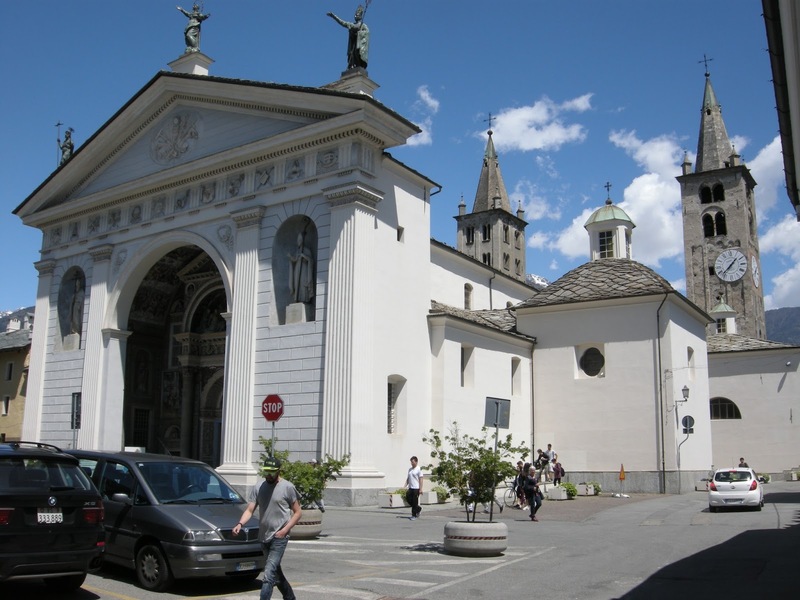 The city is famous also for the shroud of Turin, a linen cloth that is kept under glass in the Cathedral of John the Baptist. 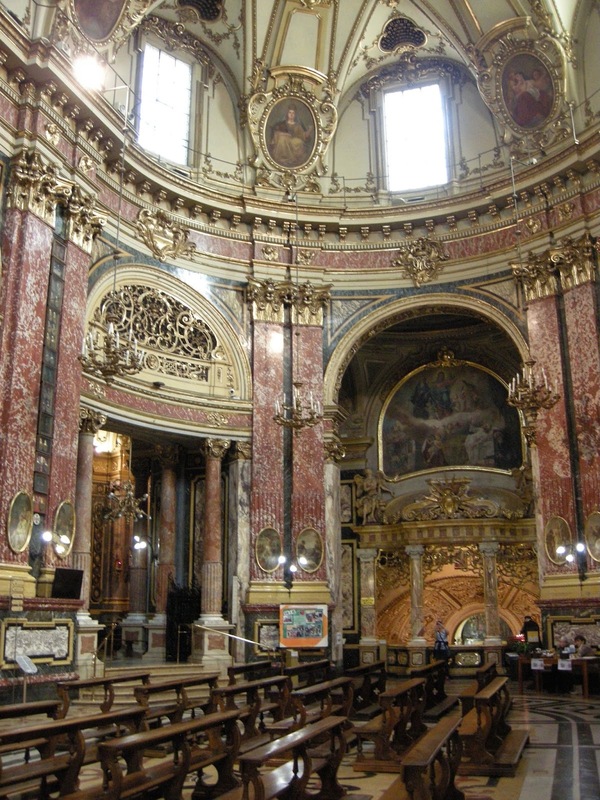 Other churches were also very impressive, in particular, the Sanctuary of Our Lady of Consolation. 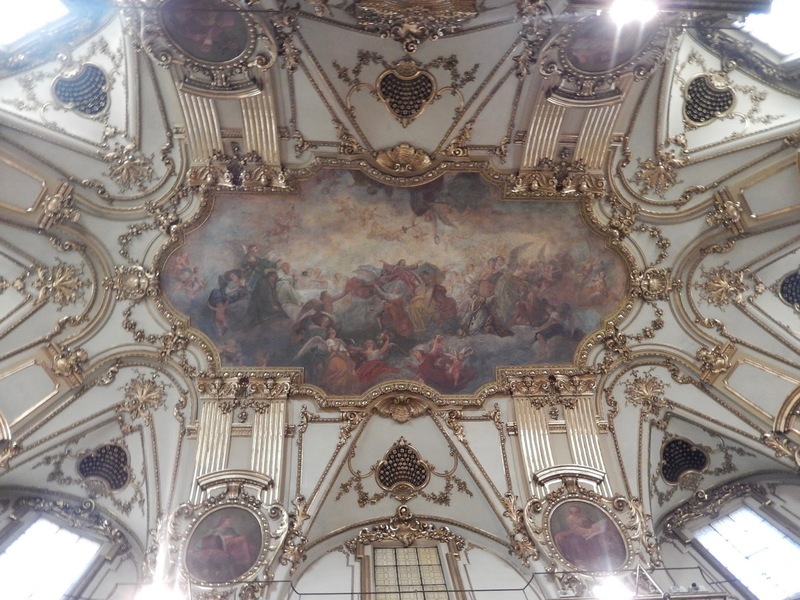 Its baroque decor is composed of marble, gold leaf and art. Wow! A highlight of our Sunday in Torino was lunch with Joe, whom I taught at NJC last year. He had discovered that we were in the city through Facebook and suggested we meet. It was good to hear about his life after his year in Switzerland. 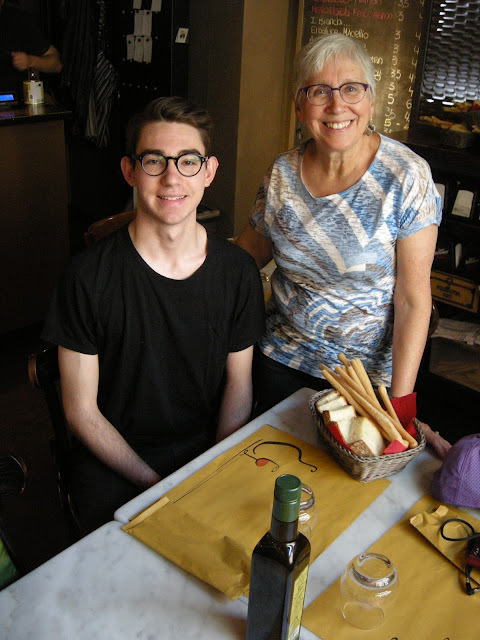 We had a lovely visit. We were pleased to discover that Torino had ancient Roman ruins too. 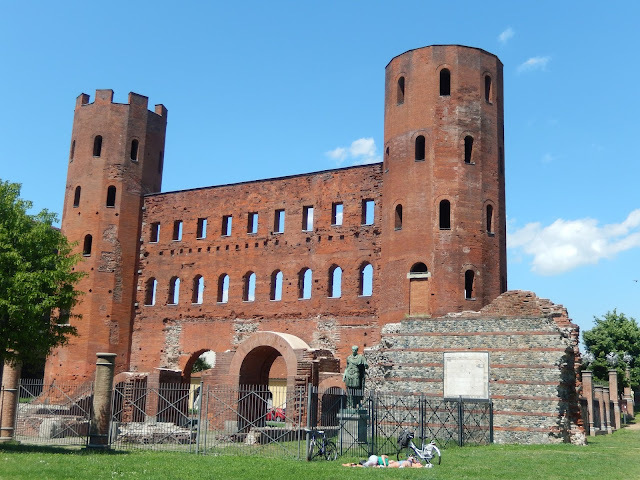 As we meandered through the city, we came across the Palatine Gate from the first century. 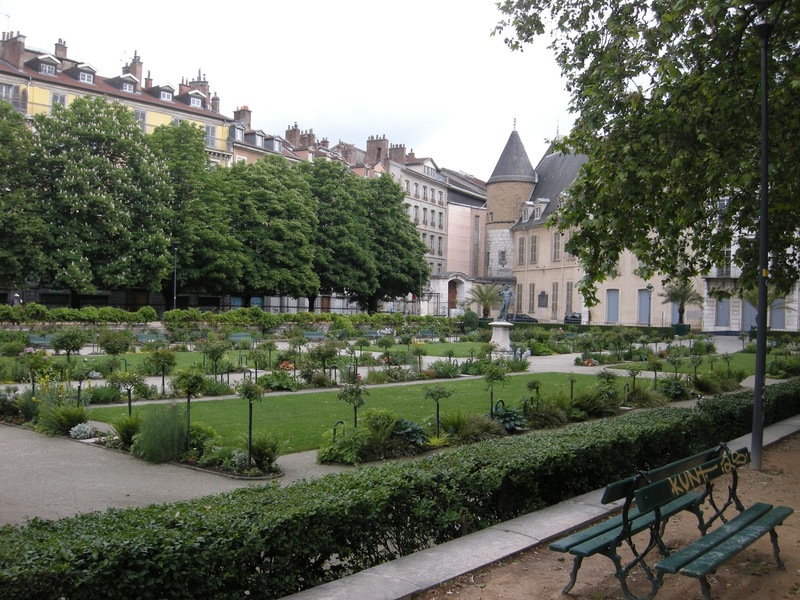 It is very well-preserved and sits in a grassy expanse with lesser ruins around it. 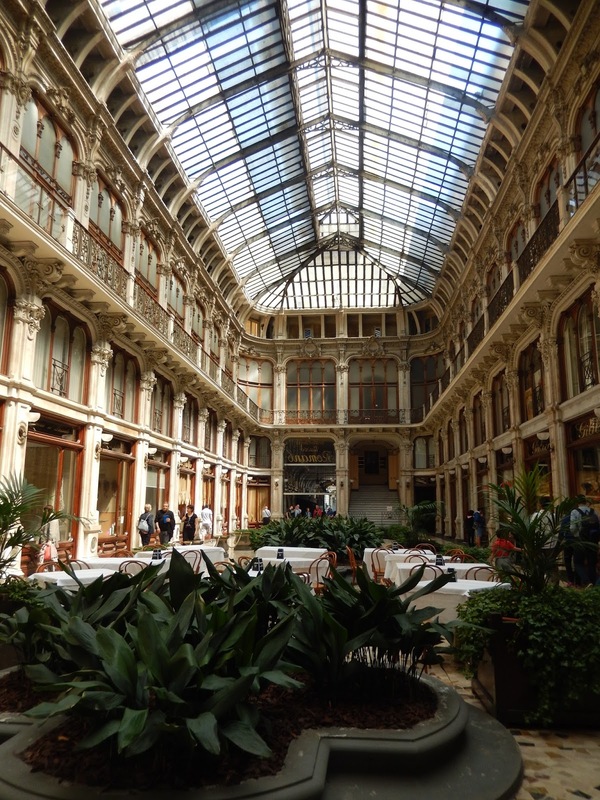 One of many grand buildings with an arcade. 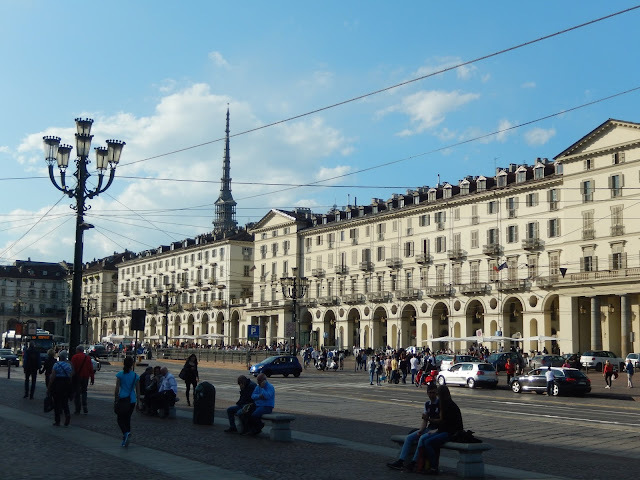 The facades of many buildings proclaim Torino's status as a former capital city. Often, we were reminded of French cities rather than Italian ones because of the style of the architecture. 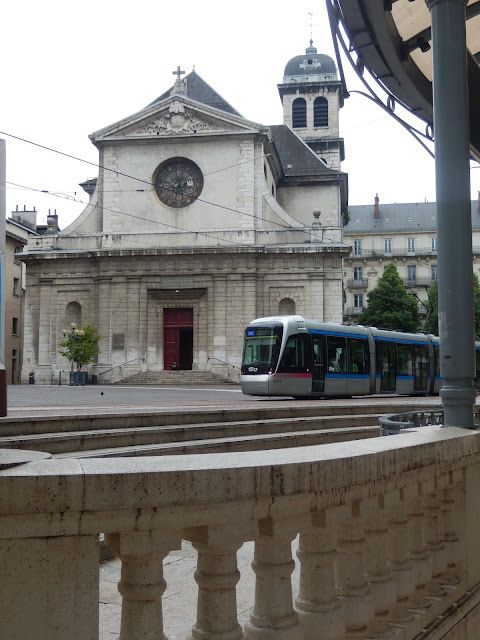 We could just as easily have been in Bordeaux or Lyon. 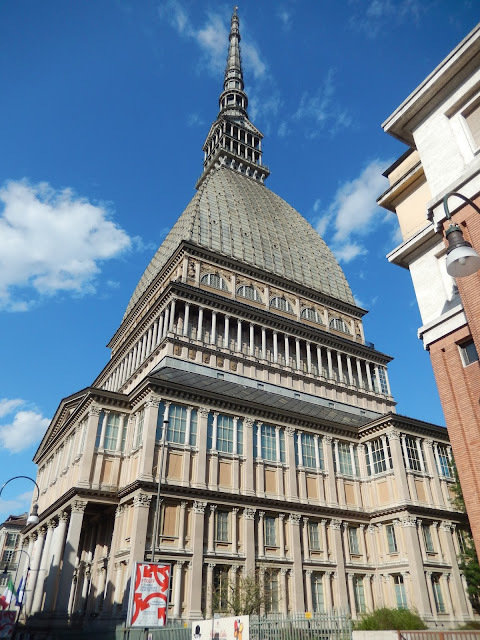 A day in Torino is not considered complete without a stop at the Mole Antonelliana, a towering structure which now houses a Museum of Cinema. We intended to go inside, but when we discovered that the line up would take an hour out of our day, we settled for a couple of photographs instead. The view from the Gran Madre di Dio, looking up the Via Po. 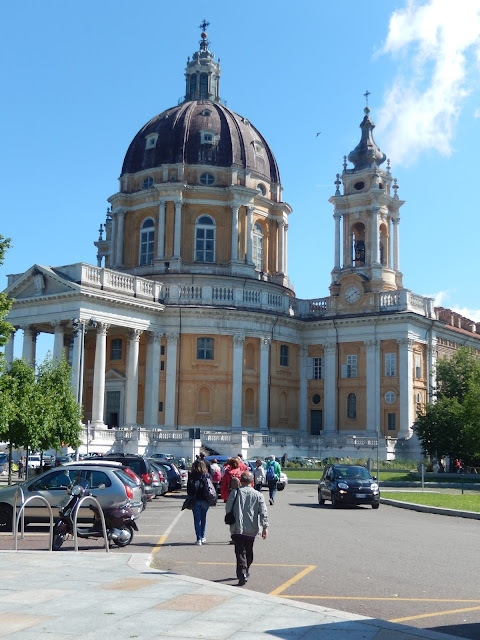 We took many more shots of the church Gran Madre di Dio, which stands on the other side of the river Po, looking over the city. 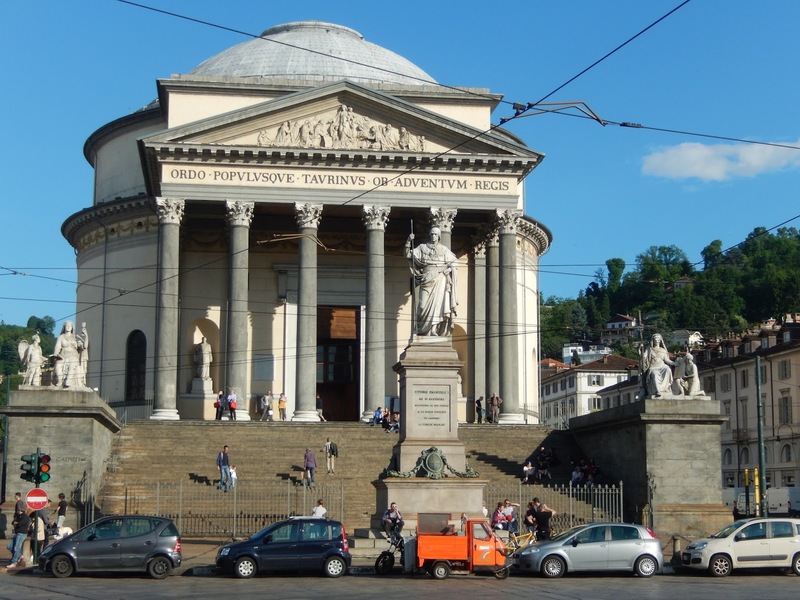 It is reminiscent of the Pantheon in Rome, with its large dome and majestic columns. 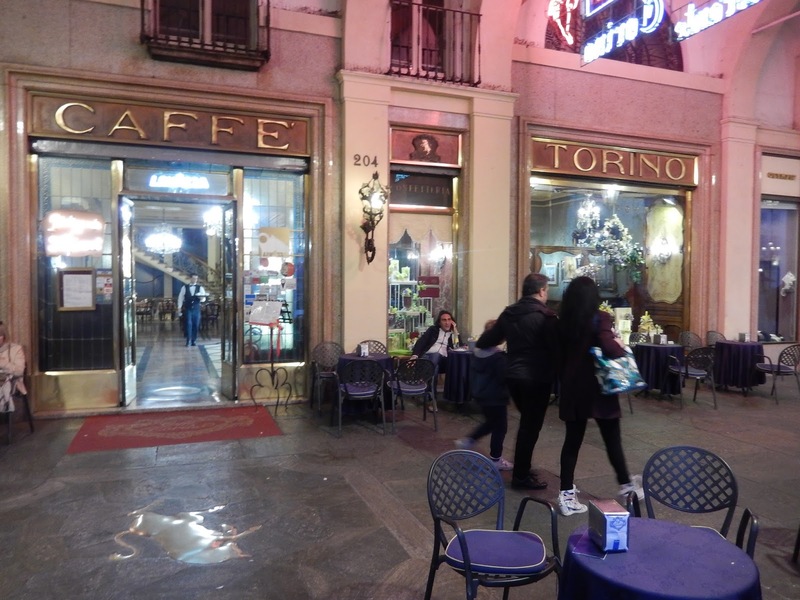 Finally, we returned to the Piazza San Carlo for dinner in style at the Caffe Torino, a restaurant that has stood in the same spot for over a hundred years. We then returned to our hotel for the night, exhilarated by our day in this marvelous city. We cannot recommend Torino highly enough. Our weekend get-away was not over, however. We still had a four hour journey home on the holiday Monday. 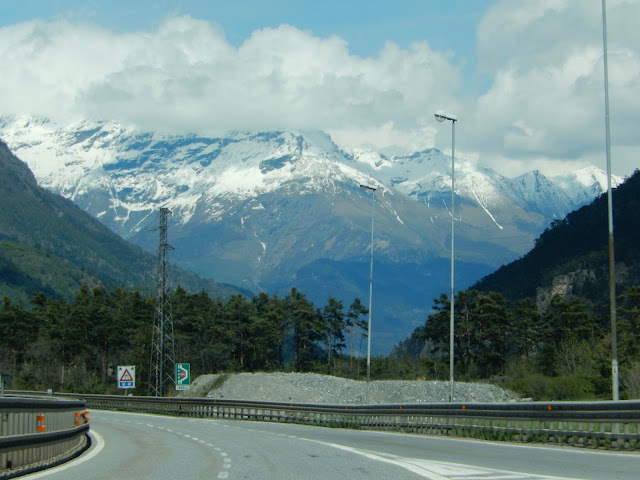 This time we headed north from Italy to Switzerland, again finding ourselves surrounded by the glorious Alps. 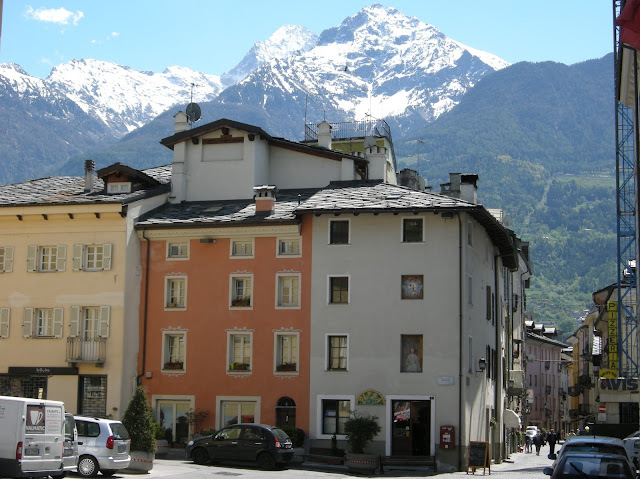 We decided to take a break near the Italian border in Aosta. What a good decision that was! Here was another great find. 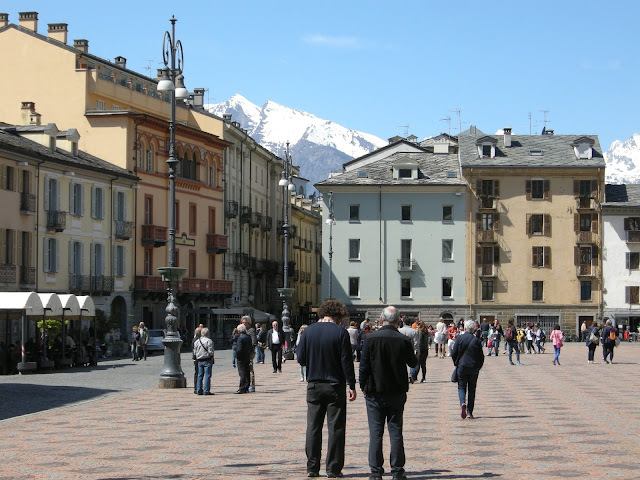 Aosta is a popular spot with the French and Swiss who can easily cross the border to get there. 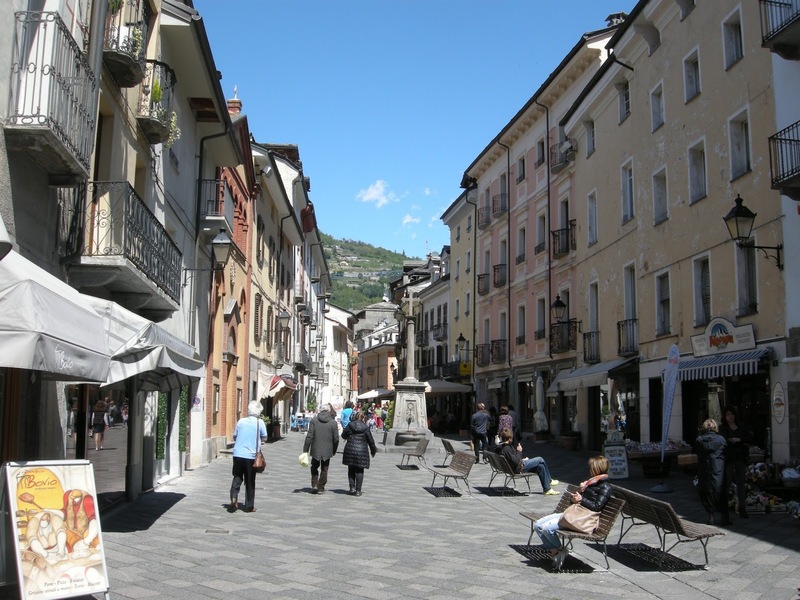 It is a ski resort in winter, but in the spring, it still attracts visitors for its Roman history and good shopping. 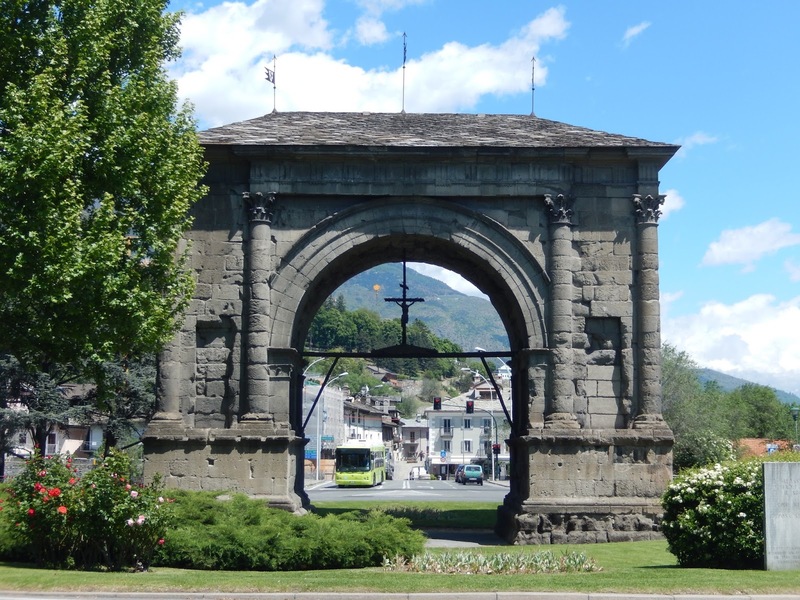 We did not know any of this when we happened upon the town. 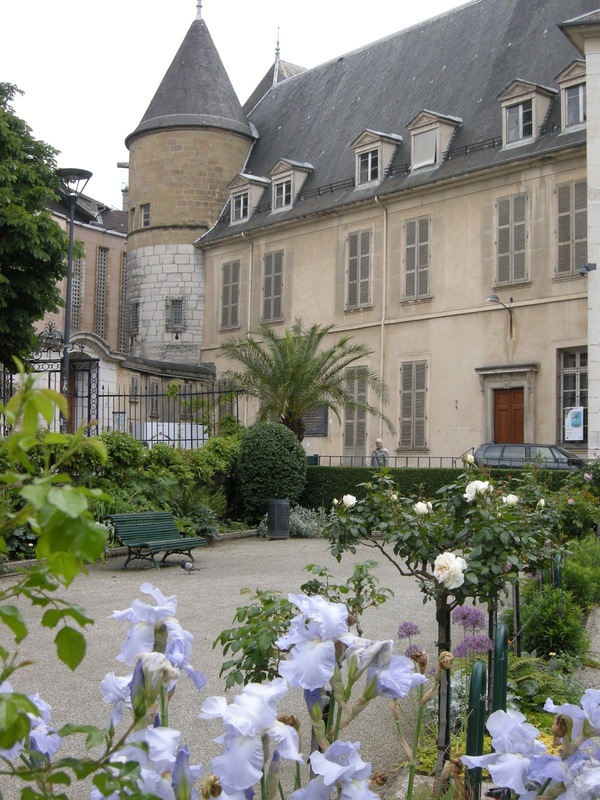 The main square is dominated by the Hôtel de Ville, an indication that the town had been claimed by its neighbour to the west at some time during its history. 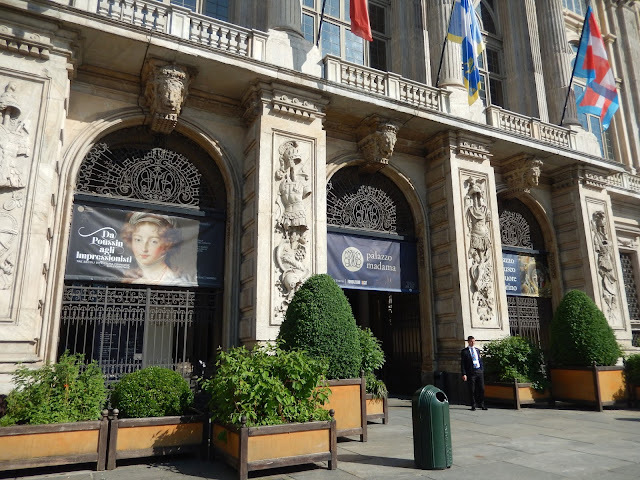 We were impressed by the neo-classical appearance of this building. 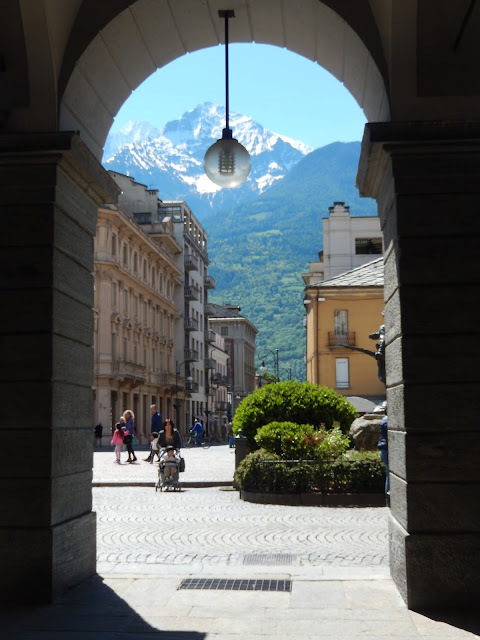 The mountains as seen from the piazza. 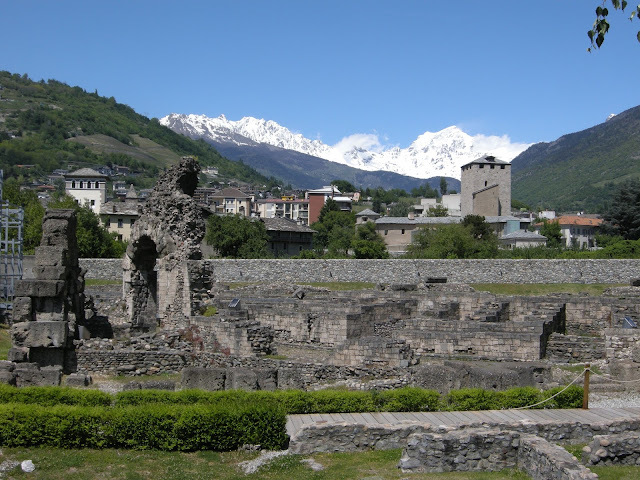 Aosta's beauty is increased by the views we had of the snow-capped Alps above us. We had ideal weather, with fabulous blue skies contrasting the peaks. 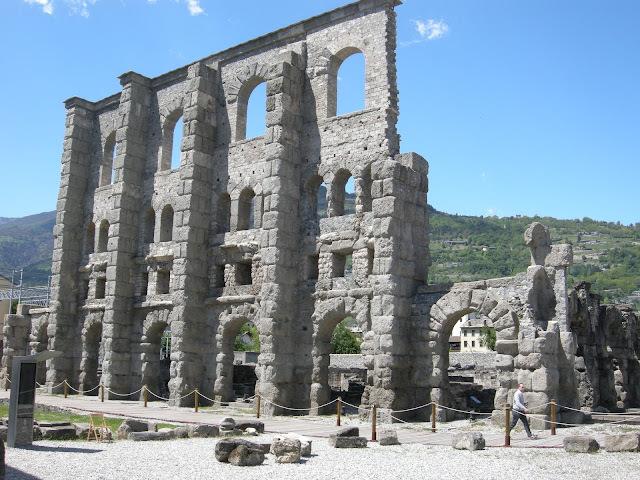 Also appealing were numerous and quite varied Roman ruins throughout the town. 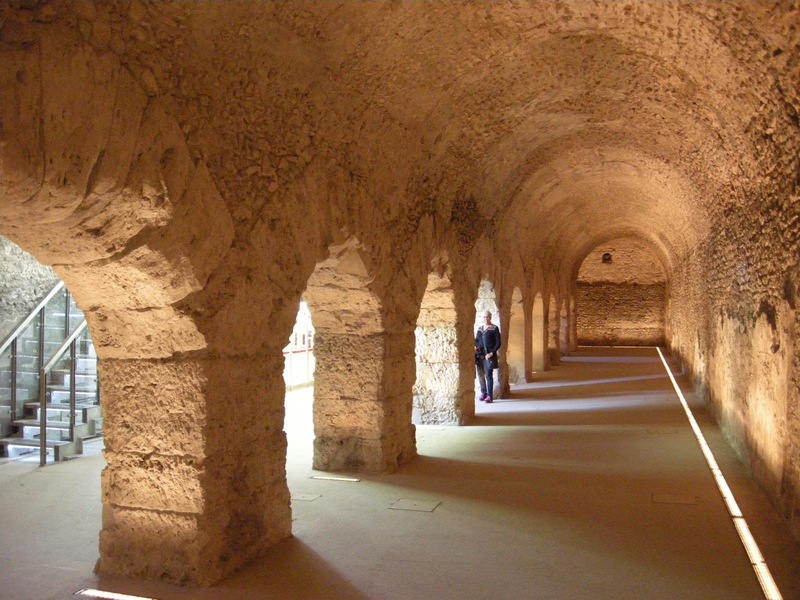 Below the church was the semi-subterranean forum and cryptoporticus. 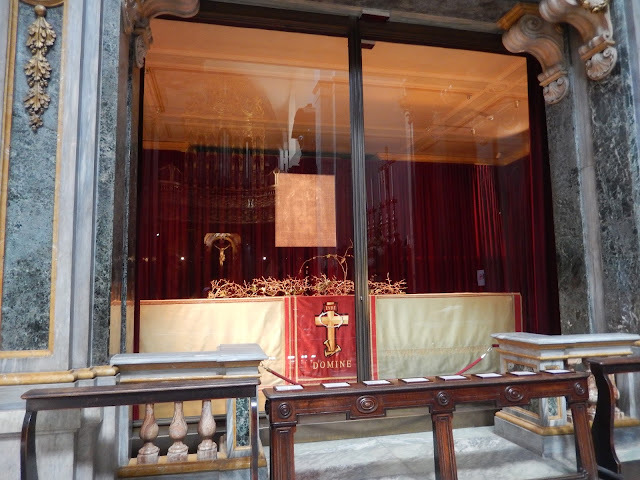 It was very extensive and well preserved. Nearby, Bob found city walls and the ruins of a Roman theatre. 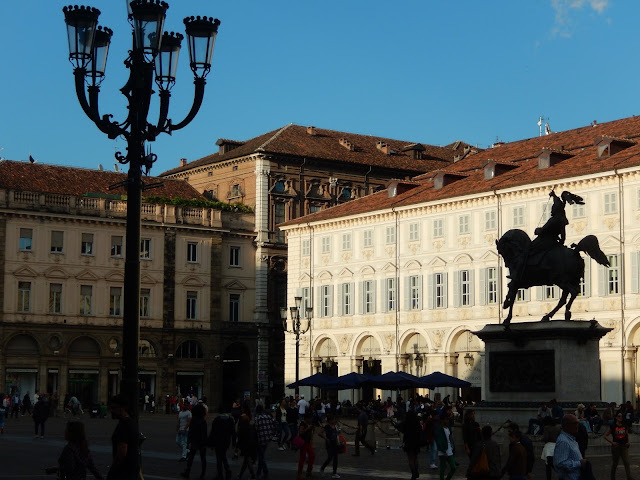 In the centre of the town, right by the tourist office, the Porta Praetoria was once the main entrance to the town, known as Augusta Praetoria during the Roman empire. Finally, just outside the central area, the Arch of Augustus still stands in tribute to the emperor. The church in the town is notable too, although we did not visit it since it was closed while we were there. 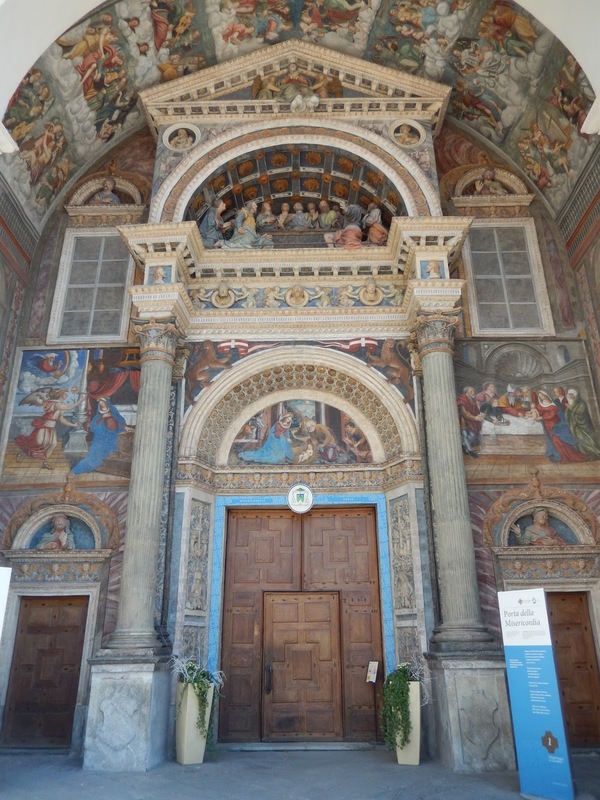 I was impressed by its beautiful doorway. I only wish I could have passed through it. Even though this was a holiday, most shops in Aosta were open for business; the streets were full of fellow shoppers. I really enjoyed this town. The view from the car window. After about 14:00, it was time to hit the road. 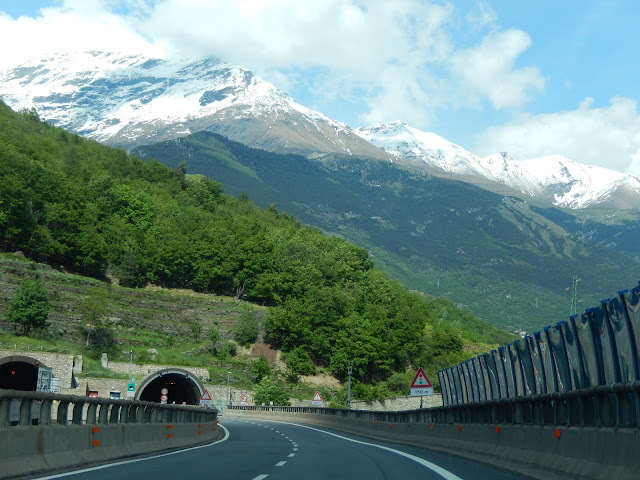 This was not a bad thing, since this road took us high up into the mountains, and through the St. Bernard tunnel into Switzerland. More spectacular vistas met us as we travelled. A few hours later, we arrived back in Neuchâtel. What a wonderful weekend it was!